When ordered on the Webshop the VA710 includes UKAS calibration, normally an extra £75, free of charge! 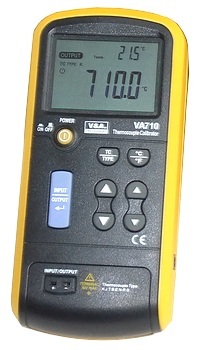 The VA710 Thermocouple Calibrator is a precision source and measurement tool for calibrating thermocouples and instruments. The calibrator measures through a thermocouple mini socket and can measure in °C, °F or mV. Supplied with soft carry case. Displays Cold Junction (ambient) temperature.